All states go through an annual process each March called benchmarking, in which historical employment and unemployment data is revised. Many states will take this opportunity to revise their TEA numbers immediately in March or shortly thereafter, based on the new 2013 annual average data. Other states may wait until later in the year to do these updates, and some that base their TEA estimates on fiscal year data will wait until the fall to do their updates. 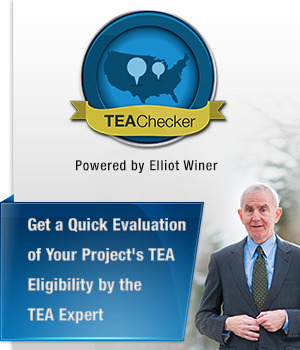 It is important to know when a state is going through this process because the potential TEA eligibility of a given area can change dramatically from one year to the next. While we will not know the actual effects of the revisions until the states release their numbers in March-April (as these revisions can sometimes vary significantly from the current published preliminary data) we can make some educated guesses as to the general trends and how they may affect individual states. For example, in states like Florida and California, it will likely become much more difficult to get TEA certifications once they implement their new TEA data in March and May respectively. Because TEA designations are made based on an area’s unemployment rate in relation to the national average, it is important to think of state rates in the context of the national unemployment rate. The economies of both Florida and California are improving and their unemployment rates are dropping much faster than that of the United States as a whole, meaning that fewer areas of these states will demonstrate unemployment rates at 150 percent of the national average. Current TEA eligibility of a particular location is no guarantee of future eligibility. What this means for those looking for TEA certifications in Florida, California, and other rapidly falling unemployment states, is that some areas that easily qualified in the past may soon require a much larger configuration to obtain eligibility or may no longer be able to qualify at all. Likewise, those seeking recertification of a current TEA may be surprised to find that the TEA cannot be recertified, or that it might require an expanded configuration. Also, those who may have benefitted by getting a low unemployment area certified as a TEA just because it happened to be located in a city or county that automatically qualified, could be in for a rude awakening when they find their location cannot be recertified because the county or city as a whole no longer has a qualifying rate. Adding to all this unpredictability is the fact that some states are changing the source data used to generate their sub area estimates. While states use different but acceptable approved methodologies, one needs to follow the methodologies and policies within each respective state. The different source data would have no effect, for example, on the independently derived county data, but can cause significant shifts in either direction on the individual sub area estimates. You, therefore, may see a particular area that previously qualified easily as a TEA that will now no longer qualify. Conversely, a particular area that previously could not meet TEA eligibility, could now potentially be part of a TEA. Each state processes the data that underlies TEA designations differently, and as such, it is important to keep key considerations in mind when applying for TEA designation or recertification. Remember that TEA designations are based on unemployment rates relative to the national average and may change on a yearly basis; just because an area was designated as a TEA in the past, does not mean that it will always be. It is important that TEA status be regularly verified as you continue to grow your business and accept new EB-5 investments.